The primary focus of Dr. Liu’s research is the biology of blood vessels. 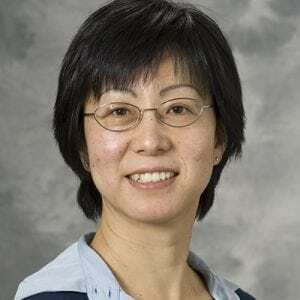 Specifically, Dr. Liu and her trainees study the cellular and molecular pathologies of restenosis and abdominal aortic aneurysm, two common vascular disorders that are in critical need of effective pharmacological treatments. Their experimental approach combines in vitro molecular and biochemical methodologies with transgenic, gene knockout, adenoviral and surgical technologies. Current research topics include cell apoptosis, programmed necrosis, vascular inflammation, progenitor cell recruitment, as well as matrix biology. Additional research interests are gene therapy and nanotechnology. To effectively study human disease, Dr. Liu has established productive collaborations with basic scientists and clinicians from a wide range of scientific and medical disciplines. Dr. Liu is also a devoted mentor, whose lab environment fosters creative thinking, multidisciplinary approaches, independence, and collaboration. Novel Paracrine Functions of Smooth Muscle Cells in Supporting Endothelial Regeneration Following Arterial Injury. Identification of a novel class of RIP1/RIP3 dual inhibitors that impede cell death and inflammation in mouse abdominal aortic aneurysm models. Synthetic Lethal and Convergent Biological Effects of Cancer-Associated Spliceosomal Gene Mutations.